EVENT REMINDER: The next ALOED Book Club discussion will take place on Saturday, March 25, at the Samuelson Alumni Center at Occidental College. The volume this time is Vicki Abeles’ “Beyond Measure.” Brunch, provided by ALOED, will be served at 11 am with dialogue about the book to follow at noon. For more details and to RSVP click here. Please join us for good food and an always stimulating discussion. You don’t even have to read the book to participate but you do have 3 1/2 weeks to finish it. Stop making excuses. Sign up for the event, get the book, READ IT and join us. You’ll be glad you did. What might we expect from Trump’s initial budget proposal in regards to education policy? The President addresses Congress this evening and is expected to submit details of his budget by the middle of March. The “Politics K-12” column for EDUCATION WEEK speculates about Trump’s spending plans for K-12 and post-secondary education. One thing he has more than hinted at is a possible 10% cut in domestic agencies to help fund a substantial increase in military and security spending. Jennifer Berkshire has changed the name of her influential blog from “EduShyster” to HAVE YOU HEARD. She has a Q & A with Derek Black, professor at the University of South Carolina School of Law, about what he sees the Trump administration doing regarding civil rights enforcement and education. He’s not at all encouraged by their very first action in this area–the rescinding of guidelines promulgated by the Obama administration pertaining to transgender student’s rights to use the bathroom of their choice. Black also ventures some predictions for the future and comments on “zero-tolerance” discipline policies. United Teachers Los Angeles is in the midst of 2 important elections. Union elections have taken place over the past couple of weeks with the ballots counted yesterday (see following item). On March 7, a week from today, the L.A. municipal elections include races for 3 critical LAUSD board of education seats which the “Ed News” has reported on in previous editions. A story in Saturday’s L.A. Times mentions the current situation the union is in and what the 2 elections augur for the future. The school board races once again pit pro-charter candidates against union-backed challengers and one incumbent. “In the school board races, UTLA-backed candidates are facing off against those supported by charter-school advocates. Although the union can’t match charter backers dollar for dollar,” it suggests, “it’s ultimately likely to spend well over $1 million to plug its candidates and to try to convince voters that charter-backed candidates are the tools of billionaire donors who would work on behalf of a Trump agenda — because Trump views increasing the number of charters as key to giving families more choices in schooling options.” Preliminary UTLA election results (see above) can be found on the union’s website by clicking here. Kilfoyle invites teachers to talk about how they’ve spent their own money to provide supplies and materials for their students and prints a long list of their responses. 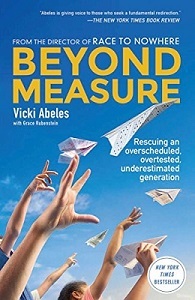 One of the recommendations Vicki Abeles makes in her book “Beyond Measure” (see note about the next book club discussion at the top of this edition) has to do with an over abundance of homework making students’ lives miserable (along with some other things) and what can be done about it. Valerie Strauss, on her blog for The Washington Post, tells about one public elementary school in Vermont that decided to ban homework and suggest that students read and play instead. The principal ran the idea by his 40 educators, how refreshing, and they all agreed. “[He] conducted a family survey asking about the policy, and most parents at the nearly 400-student school responded. The vast majority supported it,” Strauss points out, “saying their kids now have time to pursue things other than math work sheets, and many report that students are reading more on their own than they used to. He said a small minority of parents are concerned that students are missing learning opportunities from doing homework and won’t be prepared for middle school.” Find out how the idea was implemented and how it fairing since its introduction at the start of this school year. The “Numbers and letters” feature in the Sat., February 11, L.A. Times indicates that during the week of Feb. 4-10, the paper received “924 printable letters to the editor. . . . 43 letters mentioned Education Secretary Betsy DeVos, the third most discussed topic. 121 letters were written about President Trump’s travel ban, including his comments on judges. 52 readers discussed the riot at UC Berkeley over Milos Yannopoulos’ speech.” [See, the “Ed News” wasn’t the only publication preoccupied with DeVos.] Barbara Miner, in an op-ed in the Feb. 12, L.A. Times issues a dire warning about Betsy DeVos and her voucher plans. Miner is a reporter based in Milwaukee and the author of a book that takes a look back at some of the key education policies that impacted that city. Her volume is titled “Lessons From the Heartland: A Turbulent Half-Century of Public Education in an Iconic American City.” Miner reviews the history of vouchers in Milwaukee and how they expanded throughout her state of Wisconsin. “DeVos, now confirmed as secretary of Education, is not just another inexperienced member of the president’s Cabinet. She is an ideologue,” Miner warns, “with a singular educational passion — replacing our system of democratically controlled public schools with a universal voucher program that privileges private and religious ones. If you care about our public schools and our democracy, you should be worried.” The picture Miner paints is particularly bleak. Barbara Miner’s op-ed cautioning about the dangers of vouchers and the possible Trump/Pence/DeVos plan to divert up to $20 billion of taxpayer funds into them (see item above) prompted 3 letters that appear in the Feb. 18 edition of the L.A. Times. The first one favored the idea while the last 2 were opposed. What has DeVos been up to in her first few weeks in office? Valerie Strauss titles her “Answer Sheet” column for The Washington Post “So Far, Education Secretary Betsy DeVos is Just What Her Critics Feared.” Strauss offers a list of some of the things DeVos has done that has her detractors up in arms. Want a dystopian view of what education and schools might look like under the Trump/Pence/DeVos triumvirate? Look no farther than North Carolina, suggests Lindsay Wagner, a veteran education journalist, on the AJF (AJFLETCHER FOUNDATION) website. The state is rife with charters, vouchers and online, for-profit “academies” to the detriment of the traditional public school system. Wagner’s essay is titled “North Carolina: Already a DeVos World.” “As a result of DeVos efforts—along with those of other school privatization advocates—hundreds of millions of public dollars now flow to school vouchers, charter schools and virtual charter schools,” Wagner concludes plaintively. “So when she does come to visit, it will be more like a welcome home party for DeVos. North Carolina has been her playground for years.” If you are not concerned about the future of public education after viewing what’s taking place in North Carolina (see above), why not check out the situation on charter growth in Florida and how it’s being accomplished courtesy of Mike Klonsky’s SmallTalk Blog. Klonsky headlines his piece “Why DeVos is Making Florida’s Charter System Her ‘Model.’ She Practically Owns It.” “Florida’s charter schools are among the worst in the nation. The state’s so-called ‘choice’ system of charters and vouchers is highly segregated,” he maintains, “riddled with corruption and mismanagement (like FL state government in general) and has been rocked by scandal after scandal. . . . Therefore, I was not surprised to hear Trump’s ed secretary, Betsy DeVos point to Florida’s ‘choice’ system as her model and ‘blueprint’ for K-12 education.” Are you at all worried (terrified?) yet about what’s in store for public schools under the current administration? DeVos delivered some brief remarks yesterday to the Conservative Political Action Conference (CPAC). In one column for The Washington Post, Valerie Strauss reprints the speech in full. In a follow-up column she offers some analysis of what DeVos said including some disparaging remarks about how college and university faculty tell students what to say, how to say it and even how to think. Pretty inflammatory stuff. Diane Ravitch’s blog has an analysis of DeVos’ speech to CPAC (see above). Ravitch, as you can probably guess, was not impressed with what the new Sec. of Education had to say before the group. “Betsy DeVos gave a speech to the Conservative Political Action Conference (CPAC), explaining that the programs created by George W. Bush and Barack Obama had failed, and she would replace them with her own ideas. She did not point out,” Ravitch begins, “that her own ideas have failed too. Just look at the mess she has made of Michigan, where the state’s rankings on the federal test (NAEP) have plummeted, and where Detroit is a mess thanks to the miasma of school choice.” According to Jeff Bryant, on the Education Opportunity NETWORK, Trump and DeVos are readying a voucher plan to present to Congress. Because that might be a difficult sell, they are not calling it a “voucher” plan but, instead on referring to it as a “federal tax credit scholarship program.” That’s right. The word “voucher” doesn’t appear in the idea. Bryant explains how this is a clever ruse (he uses the term “deceptive scheme”) and why opponents of vouchers need to be careful how they play their cards in an attempt to defeat it. “So whether the plan is for tax credits or vouchers, in either case, public funding is redirected from public schools to private institutions,” he clarifies, “and the impact on funding available for public education is the same. There are reasons for the Trump administration’s deception.” You might want to read up on this topic as the battle lines are being drawn in anticipation of a bitter struggle to come. Marshall High may have won the Super Quiz portion of the LAUSD Academic Decathlon (see the previous edition of the “Ed News) but they couldn’t keep Granada Hills Charter High from repeating as overall district winner. Granada Hills is also the defending national champion. A story in the Feb. 12, L.A. Times describes the victory and how the Decathlon competition works. South Pasadena High was victorious in the separate L.A. County contest. The LAUSD winners were announced at a gathering at Hollywood High on Friday, Feb. 10. “The competition has 10 portions that contribute to the scoring,” the article explains, “and all had to relate to [this year’s topic] World War II. The first day of L.A. Unified’s competition took place Jan. 28 at the Roybal Learning Center, west of downtown, with students demonstrating their skills at delivering a speech, participating in interviews and composing essays. The Feb. 4 wrap-up competition also was held at Roybal. In the morning, students tested in eight subjects: art, economics, language and literature, math, music, science and social science. The Super Quiz, where teams submit answers to questions before a cheering throng, began in the afternoon. The Super Quiz is the only public event.” The top 10 scoring LAUD teams will advance to the next round which is the state competition in Sacramento in March. The national championship will take place in April in Madison, Wisconsin. Teams from the LAUSD have been victorious at the national level 17 times since 1987. The Obama administration made a concerted effort to investigate and close down some notorious for-profit colleges that were taking advantage of students in various ways. The Trump administration is revisiting that effort and the for-profits couldn’t be happier as some of their stock prices have soared recently. A story in The New York Times reviews the abrupt change in policy and what is all means for students, investors and the colleges themselves. “While some career training schools delivered as promised,” it points out, “critics argued that too many burdened veterans, minorities and low-income strivers with unmanageable tuition debt without equipping them with jobs and skills that would enable them to pay it off. After years of growing complaints and lawsuits, the [U.S. Dept. of Education] moved aggressively to end abusive practices that ranged from deceptive advertising to fraud and cost students and taxpayers billions of dollars.” That may all be coming to an end under Pres. Trump and Sec. DeVos. SAD! ProPublica has an extensive investigative piece on how for-profit alternative charter schools in Florida are being used to hide dropouts and scam the accountability system in other ways in the Sunshine state. “Alternative schools at times become warehouses where regular schools stow poor performers,” it reveals, “to avoid being held accountable. Traditional high schools in many states are free to use alternative programs to rid themselves of weak students whose test scores, truancy and risk of dropping out threaten their standing, a ProPublica survey of state policies found.” The report focuses on how one school in Orlando is used to fudge the numbers. Steve Lopez, in his Sunday, Feb 12, column in the L.A. Times, features an Ontario Rotary Club luncheon that highlights some successful public school students in the pre-K-8 Ontario-Montclair School District who overcame some pretty difficult obstacles and have some ambitious education goals ahead of them. Lopez headlines his piece “If You Think Public Schools Are Failing, You Haven’t Met These Kids.” “President Trump’s new education secretary thinks charter schools and vouchers are the way to go. But at the luncheon,” Lopez writes, “Ontario-Montclair School District Superintendent James Hammond and board President Elvia Rivas said there may be no better strategy than investing sufficiently in traditional schools and giving them enough autonomy. And letting them put children before ‘adult-centered politics,’ as Hammond put it.” In light of the DeVos confirmation to head the Dept. of Education, The New York Times Magazine has an extensive and important article reviewing the history of public education and the whole concept and meaning of “public” institutions in this country. It asks the critical question “Have We Lost Sight of the Promise of Public Schools?” Is DeVos the threat to our public school system as her critics worry, or is her elevation to become the next Sec. of Education just the catalyst pro-public school supporters need to rally around? “If there is hope for a renewal of our belief in public institutions and a common good, it may reside in the public schools. Nine of 10 children attend one, a rate of participation that few, if any, other public bodies can claim, and schools, as segregated as many are, remain one of the few institutions where Americans of different classes and races mix. The vast multiracial, socioeconomically diverse defense of public schools that DeVos set off,” it concludes on an upbeat note, “may show that we have not yet given up on the ideals of the public — and on ourselves.” The ELC (EDUCATION LAW CENTER) out of the Graduate School of Education at Rutgers University has a list of the most “fiscally disadvantaged school districts” in the U.S. It comprises 54 different districts in 20 states. California is number 1 with 16 districts making the list including Bakersfield City, San Francisco Unified and Santa Barbara Unified. “This list of the most fiscally disadvantaged districts highlights the urgent need for school finance reform in many states,” the report specifies in the “Conclusion” section. “This reform must start with a determination of essential education resources and end with a funding formula that accounts for district poverty concentration and local fiscal capacity. It will require replacing outmoded, arbitrary funding formulas and the historic method of distributing funding based on prior year spending and political, not educational, considerations.” The full report (6 pages) is titled “Is School Funding Fair? America’s Most Fiscally Disadvantaged School Districts.” You can find the chart with the list of districts on page 3 of the report. Fellow ALOED member Larry Lawrence and I attended a “Friends of Education” event presented by Antioch University at their Culver City campus on Thursday evening July 16. Julian Vasquez Heilig spoke about equity and education policy in the age of Trump. He is a researcher, blogger and Professor of Educational Leadership and Policy Studies and the Director of the Doctorate in Educational Leadership at CSU Sacramento. He addressed charters, vouchers and what education activists and people opposed to the Trump/Pence/DeVos agenda for dismantling the public school system can do to fight back. The audience consisted primarily of students in the credential program at Antioch and interested community members. Heilig spoke for approximately 45 minutes and answered questions for 15. A reception with refreshments was held prior to the event. I hate to keep beating a dead horse, as the saying goes, but No Child Left Behind has been pretty universally condemned as a failure when it came to education policy. Helen F. Ladd is a professor of Public Policy and Economics at Duke University and takes an authoritative look back at NCLB in the Journal of Policy Analysis and Management. Her article is reprinted in the Wiley Online Library website. “Although NCLB included some components that generated positive, if qualified, effects,” she points out, “my overall conclusion is that NCLB was deeply flawed.” Ladd discusses the few positive components of the law and then details 3 major weaknesses in her analysis. Many states, including California, are experiencing teaching shortages. Previous editions of the “Ed News” have chronicled this alarming phenomenon and suggested reasons for its existence. One of them is high teacher turnover. An article in Tuesday’s L.A. Times describes how the Great Public Schools Now organization, a strongly pro-charter group, has provided grants totaling almost $900,000 to 3 charter school networks and one traditional LAUSD public school to work on improving teacher retention. “Recent, comprehensive data are hard to come by, but an early study of Los Angeles area charters, published in 2011,” the piece points out, “found that they were having to replace on average 50% of their instructors every year. To qualify for a grant from Great Public Schools Now, a charter operator had to meet certain academic performance parameters. It also had to have lost no more than 30% of its faculty since the last school year. That’s still well above the state average of 10.6%.” Corporate “reformers,” privatizers and their allies like to promote the idea that ending tenure will improve the teaching profession (i.e., the Vergara case in California and others in New York and Minnesota). Mercedes Schneider, on her “EduBlog” at deutsch29, takes a look at the premise and finds, at least in Louisiana, the ending of tenure led to an exodus of teachers from the profession. Tenure was ended in the Pelican state beginning in 2012 after Act 1 was passed by the legislature. What has been the impact? Schneider features a new study released Wednesday from the Education Research Alliance (ERA) in New Orleans that looks at the data on teacher turnover. “Act 1 began in 2012 as House Bill 974. The reason it is called Act 1,” she explains, “is that the 2012 Louisiana legislature rammed it though as the first act, with calculated speed, amid an atmosphere dripping with then-Governor Bobby Jindal’s business-and-industry-backed intention to bring “accountability” in the evaluating of the state’s teachers. Once 2012 hit, Louisiana teachers began considering how and when to leave the profession. And each year beginning with 2012, Louisiana’s teacher workforce has experienced a noticeable exit of many experienced, seasoned teachers who otherwise would not have likely chosen to leave the profession so soon.” Do you know the difference between a summative and formative assessment? If you’re not sure or want some clarification, the “High School & Beyond” column for EDUCATION WEEK has a short video (2:00 minutes) explaining what a formative assessment is. Ever heard of the “Hamburger Method” for writing as essay? It’s a graphic organizer geared to elementary students. The “Curriculum Matters” column for ED WEEK features a short video (54 seconds) narrated by Briana Sotomayor, a cute and self-assured 4th grader in rural West Virginia, who explains how to write an essay. It’s worth your time just to listen to her describe how it works. *Eraldo Banovac is an energy expert and a university professor. He was born in 1955, in Pula, Republic of Croatia. and Presidents’ Day. Look for the next edition on Friday, February 24. The “Ed News” has documented teacher shortages that are plaguing states nationwide. California is not immune to that troubling trend. A new report from the Learning Policy Institute, featured in the “Teaching Now” column for EDUCATION WEEK chronicles the shortage of qualified educators in particular fields and the major impact that is having on classrooms up and down the Golden State. Fields most impacted include special education, math, science and bilingual education. “The state has wrestled with teacher shortages for some time now, and the California-based think tank says that districts have responded to the shortages by hiring underprepared teachers, relying on substitute teachers, and assigning teachers out of their fields of preparation. This is disproportionately happening,”the piece points out, “in schools that serve the most vulnerable students, the report found through analyzing data from California government sources. . . . The study points to research that shows that underprepared teachers depress student achievement and have higher attrition rates.” You can find the full report (31 pages),titled “Addressing California’s Growing Teacher Shortage: 2017 Update,” which is, by the way, co-authored by Linda Darling-Hammond, by clicking here. Another billionaire backer of charter schools came out in opposition to Betsy DeVos’s confirmation to head the Dept. of Education (DoE). He is Silicon Valley venture capitalist Arthur Rock and his announcement followed by one day that of Eli Broad who is also resisting her selection. The reasons for Rock’s position are explored in an article in FORBES. Rock is a well-known supporter of school “choice.” “[He] is an active philanthropist in education reform. From 2006 to 2008,” the account mentions, “Rock contributed $16.5 million to Teach for America. He also donated $1.5 million to Knowledge is Power Program (KIPP), the country’s largest network of charter schools.” Mercedes Schneider, on her “EduBlog” at deutsch29, carefully reads the responses Betsy DeVos provides to a number of written questions regarding education submitted by Senate Health, Education, Labor and Pensions (HELP) Committee ranking member Patty Murray (D-WA). Schneider reports on DeVos’s answers related to special education and how private schools should provide services to pupils with disabilities. They offer some rather eye-opening insights into DeVos’ knowledge and awareness (or lack thereof) of federal law in this area. “[DeVos] does not respond,” Schneider complains, “to the idea of supporting efforts to require that private schools that receive public funding provide the same rights and protections that traditional public schools must offer to the parents of children with disabilities.” Time to lighten things up a bit. Humorist Andy Borowitz has a hilarious piece about Donald Trump, Betsy DeVos, Frederick Douglass and Black History Month in his comedy column in THE NEW YORKER, “THE BOROWITZ REPORT.” You’ll just have to read it to get the connection. It’s short and if it doesn’t bring at least a smile to your face, you are beyond hope. Rachel Maddow, on her eponymous “Rachel Maddow Show” on MSNBC Friday evening, delves deeply into a number of issues surrounding Betsy DeVos and her confirmation vote. Maddow reviews the controversial investment DeVos insists on keeping for the biofeedback company Neurocore that makes some unsubstantiated claims about curing autism, ADHD and other conditions in children; why the vote on DeVos was been delayed; the massive number of constituent calls jamming Senate phone lines and fax machines; a ham and pineapple pizza sent to one senator’s office when the voter couldn’t get through on the phone and campaign donations from DeVos to a number of Republican senators who are voting on her nomination. Maddow has 2 segments on DeVos (15:02 minutes and 8:15 minutes). Stick with the first one even though it appears to begin as a Food Channel piece. The volume of opposition to DeVos has turned into an “avalanche” according to a story from POLITICO. It’s not just the teachers unions who are so vehemently against her nomination. Parents, teachers, celebrities and community members have jammed senate phone and fax lines and sent thousands of tweets and emails urging a “no” vote on her confirmation. “The campaign kicked into high gear [last] week,” the article points out, “after two Republican senators, Susan Collins of Maine and Lisa Murkowski of Alaska, announced their opposition, leaving the charter schools advocate hanging by a 50-50 thread. Just one more ‘no’ vote and DeVos is done — a prospect that seems tantalizingly close for Democrats but that GOP leaders say they’re confident won’t happen.” CAPITAL & MAIN reports on a little known characteristic exhibited on occasion by Betsy DeVos. It seems she can be rather vindictive, especially towards Republicans who cross her, when it comes to pushing her right wing education agenda. The author of the piece uses a bill in the Michigan legislature dealing with schools in Detroit as his case study of how DeVos can act when opposed by fellow Republicans. “The bottom line for Michigan Republicans — and perhaps for GOP representatives anywhere — is that you cross or ignore DeVos and her educational crusade,” he concludes, “at your own peril.” All the controversy and opposition surrounding the DeVos nomination boils down to a simple question. If confirmed, can she be an effective Sec. of Education? Peter Cunningham, the author of a commentary for THE HECHINGER REPORT, should be familiar with the inner workings of the job as he served as press secretary to former Sec. of Education Arne Duncan from 2009-12. He offers some advice to DeVos should she inherit the position. “Many progressive reformers oppose DeVos, but they also know that the real work of improving schools and helping kids has to move forward, regardless of who is running the U.S. Department of Education. But the first move is hers. If DeVos doubles down on vouchers,” he warns, “as Trump has promised, she will spend the next four years on defense. If, on the other hand, she signals a more open mind on equity and accountability, she will find partners willing to look past the rhetoric and actually get something done for kids.” Supporters of DeVos are fighting back with hundreds of thousands of dollars of paid ads now appearing on the airwaves attacking “extreme liberals” for their opposition and claiming it’s part of a sexist campaign against the poor billionaire philanthropist. Valerie Strauss, in her blog for The Washington Post, profiles the 11th hour defense being organized to save Pres. Trump’s nominee. You can view one of the 30 second ads being run in support of DeVos in the article. “Although supporters of DeVos blame the opposition on Democrats and the two teachers unions, the National Education Association and the American Federation of Teachers, critics come from the political spectrum. Some conservative Republicans oppose her in part because they say she supports the Common Core State Standards,” Strauss chronicles, “though she says she doesn’t; she is a strong ally of former Florida governor Jeb Bush who was a big Core supporter for years. Parents with children with disabilities have come out against her, saying they don’t believe she will protect their interests, and many school choice supporters, such as billionaire Eli Broad, who would have been expected to support her are in fact opposing her, saying they don’t think she believes in public education. She says she does. Hundreds of students and graduates from the Christian college she attended, Calvin College, wrote against her nomination too, saying she isn’t qualified and didn’t care enough about public schools.” Strauss even mentions the ham and pineapple pizza ploy used by a voter in Utah to get through to her senator that Rachel Maddow references in her segment on MSNBC (see above). Valerie Strauss, on her blog for The Washington Post, very carefully parses the wording of one of the commercials being run on behalf of DeVos (see above). She finds one sentence particularly revealing in her analysis. “The ads, put out by a group run by former Louisiana governor Bobby Jindal” Strauss suggests, “are what you’d expect from a pro-DeVos ad: Democrats angry that Trump won can’t stand her, and her opponents don’t want equal opportunity education for all students like she does. But there’s wording at the end that is interesting.” Is Betsy DeVos providing “alternate facts” when it comes to graduation rates at some virtual, online charters? In answer to a written question submitted by Senate HELP Committee ranking member Patty Murray (D-WA), DeVos furnished a number of such schools with graduation rates over 90%. Only problem was those figures were not true! NPR called it “Betsy DeVos’ Graduation Rate Mistake.” I’d call it something that’s not as civil. “DeVos built an argument for virtual charter schools on language apparently taken — without citation — from a report written by a for-profit company with a huge stake in the industry. In the process, DeVos either knowingly or unwittingly mischaracterized the official graduation rates of virtual schools,” it concludes, “making them look more successful than they are and making online learning, in general, look like a reliable pathway to student success when research suggests it is anything but.” Anyone have any idea why she might do that? Just asking. Andy Borowitz has a humorous take on the Betsy DeVos nomination (see THE NEW YORKER item above). Actress and comedian Melissa McCarthy takes on the role of Trump Press Secretary Sean Spicer for a hilarious sketch on Saturday Night Live (8:06 minutes). I only mention it because it includes a very brief appearance by SNL regular Kate McKinnon poking fun at DeVos (it runs for less then a minute starting at around the 5:50 mark). You can view the very funny segment on YouTube by clicking here. Valerie Strauss, on her blog for The Washington Post, has some background information about DeVos’ testimony as it relates to the SNL bit (see above). Diane Ravitch’s blog also featured the Sean Spicer spoof. Betsy DeVos has had her greatest impact on education in her home state of Michigan. That’s why the Detroit Free Press’ editorial against her nomination is so compelling. It’s titled “U.S. Senate Must Reject DeVos Appointment.” “Make no mistake: A vote to confirm Betsy DeVos as U.S. Secretary of Education is a vote to end public education in this country as we know it. . . . DeVos is unqualified in every respect,” it says bluntly, “to serve as head of this critical department, and the U.S. Senate must vote Tuesday to reject her nomination.” The author of an opinion piece for THE HECHINGER REPORT is an associate professor at Harvard University Graduate School of Education. She fears that if Betsy DeVos becomes the next Sec. of Education that due to her promotion of charters, choice and vouchers, one of the first casualties will be educational equity. “School choice as the sole vehicle for promoting equity,” the author claims, “will instead contribute to racial segregation and further divide us. This is the wrong choice for our nation’s education system. Betsy DeVos promotes a vision for society that outwardly extols the idea of equity but in reality does little to ensure it.” Despite all the complications pertaining to Betsy DeVos’ testimony, financial disclosures and responses to written queries, 2 experts believe a strong ethical case can be made against her. Norman Eisen and Richard Painter, co-authors of the piece for THE HILL, served as chief ethics lawyers for Pres. Obama and Pres. George W. Bush, respectively. Both now work for the Committee for Responsibility and Ethics in Washington (CREW). “As former ethics counsels to Presidents Obama and George W. Bush, we’ve reviewed more than our share of ethics filings for cabinet nominees,” they relate. “Seldom have we seen a worse cabinet-level ethics mess than that presented by Betsy DeVos, President Trump’s choice for education secretary.” They proceed to provide chapter and verse to bolster their unfavorable assessment. Dr. Michael Flanagan, member of the BATs (Badass Teachers Association), believes the campaign to oppose Betsy DeVos, win or lose, can be used as a template for other activists around the country. He’s created an “Activist’s Rosetta Stone” that lays out a detailed plan of how to protest various actions and policies. “The groundswell of organized opposition against DeVos is a positive for all other resistance movements. It is something to build on,” Flanagan recommends. “It is a way in which we can begin to coalesce, to open up the lines of communication between disparate social and political constituencies.” Senate Democrats engaged in a round-the-clock stalling tactic by talking all last night and into the early hours this morning in a last-ditch attempt to find one more Republican to oppose the nomination of Betsy DeVos. Kamala Harris, the junior Senator from California, was one of the prominent participants. A story in today’s L.A. Times describes the Democratic action. *Nilantha Ilanguamuwa is the editor and the founder of the Sri Lanka Guardian, an online daily newspaper, and he’s also an editor of Torture: Asian and Global Perspectives, a bi-monthly print magazine published by the AHRC (Asian Human Rights Commission) based in Hong Kong and DIGNITY (The Danish Institute Against Torture) based in Denmark. As highlighted in Tuesday’s “Ed News,” Pres. Trump selected Neil Gorsuch, of the federal 10th Circuit Court of Appeals, as his nominee to replace Justice Antonin Scalia on the Supreme Court. The “School Law” column in EDUCATION WEEK profiles the selection and discusses some of the education cases he’s been part of. “When it comes to education,” it relates, “Gorsuch has written or joined opinions in cases involving school discipline, education finance, special education, and religion in the public square, among others.” The author of the column proceeds to scrutinize some of Gorsuch’s key education rulings. Almost all of the education focus in Congress recently has been on the Senate and its confirmation of Betsy DeVos. When all that dust settles things will get back to the normal work of passing legislation and that requires action by both the House of Representatives and the Senate. The House Education and Workplace Committee has a new chair, Virginia Foxx (R-NC). The BATs (Badass Teachers Association) have a profile of Foxx on their website and it’s not very encouraging if you support public education and unions. The piece is titled “BATs Beware! A Foxx is Loose! !” By the way, there are 4 Californians on the committee (1 Republican, 3 Democrats) that is controlled by the GOP. And finally, last Friday’s edition of the “Ed News” highlighted an editorial in that day’s L.A. Times that featured a report from the U.S. Dept. of Education that was critical at how the department’s School Improvement Grant money was being spent. That item prompted 2 letters-to-the-editor that appear in yesterday’s L.A. Times. The first is from a professor of psychology at CSULA. New England from Houston, Texas. Sen Tim Kaine (D-VA) is a member of the Senate HELP Committee that voted on Betsy DeVos’ confirmation this morning. Prior to that action he wrote a letter to people who contacted him about the DeVos nomination. Diane Ravitch’s blog reprints that letter with the reasons why Sen. Kaine is opposing her selection. “As a member of the HELP Committee, I asked Mrs. DeVos questions regarding her education, experience, and policy positions. While I appreciate Mrs. DeVos’s willingness to serve,” he reveals, “I have decided to oppose her nomination. Mrs. DeVos failed to show that she was a strong advocate for public schools, accountability, and civil rights. Commitment to these principles is essential to serving as Secretary of Education and carrying out the duties of this position in a manner that will benefit all of our nation’s students.” The “Politics K-12” column for EDUCATION WEEK discusses the probability of DeVos being confirmed by the Senate HELP Committee and the full chamber. For a hint of what they are predicting just look at the title: “Here’s Why Betsy DeVos Will Likely Be Confirmed, Despite Pushback.” “The silver lining for Democrats: DeVos as education secretary may not be all bad for her opponents. She has become so controversial,” the item concludes, “that Democrats are now fundraising off of her nomination. In an email circulated this weekend, the re-election campaign of Sen. Tammy Baldwin of Wisconsin—a state Trump unexpectedly won—asked for contributions of $5 or $10 to ‘strengthen opposition to [DeVos’] confirmation.’ Baldwin is expected to face a tough re-election bid in 2018.” How broad and deep is the opposition to DeVos? Another article from the same column in ED WEEK claims that “Nearly 250 Education-Related Groups Urge Senators to Reject Betsy DeVos.” The story includes a letter sent to senators urging them to deny her confirmation. It lists all the groups, national, state and local, that support that position and signed the letter. “On behalf of The Leadership Conference on Civil and Human Rights and the 247 organizations listed below,” the letter begins, “we urge you to oppose the confirmation of Betsy DeVos to be the next U.S. Secretary of Education. All parents and students in this country – a majority of whom are of color or are low-income – want the best education, support and dignity for their own children. We stand with them and cannot support a nominee who has demonstrated that she seeks to undermine bedrock American principles of equal opportunity, nondiscrimination and public education itself.” Sen Patty Murray (D-WA), ranking member of the Senate HELP Committee, submitted a list of 139 follow-up questions to Betsy DeVos that Murray believes were not addressed by the nominee during the formal hearing held by the committee on Jan. 17. For her column in The Washington Post, Valerie Strauss has 2 separate articles relating to DeVos’ responses to the queries. The first item is an overview of some of the answers that DeVos provides and is titled “Democrats: DeVos Didn’t Provide ‘Anywhere Close to Satisfaction’ on Our Questions.” “Murray’s questions covered a wide range of education issues,” Strauss writes in that one, “from civil rights to for-profit colleges to virtual schools and enforcement of the Every Student Success Act — the successor law to No Child Left Behind. She was also asked questions about her finances. DeVos and her family are large donors to the Republican Party, including to five members of the committee that is voting on her nomination.” The second item reprints the questions submitted by Murray and includes DeVos’ answers. Several members of the BATs (Badass Teachers Association) met with education staff for Democratic Senators Bernie Sanders (VT) and Maggie Hassan (NH) to discuss pressing issues related to education including special ed, ESSA and Betsy DeVos among others . Both Sanders and Hassan are members of the Senate HELP Committee which voted on the confirmation of Betsy DeVos earlier today. You can read a summary of the meetings with both senators’ representatives by clicking here. Are rural people who voted for Trump going to eventually regret their decision? Jeff Bryant, on the Education Opportunity NETWORK, believes so, especially when it comes to education policies. He provides some statistics regarding rural schools and the students who attend them and some of the problems and issues they face. “What’s sadly ironic,” Bryant points out, “is that these rural communities that will perhaps be most devastated by the school choice plan DeVos and Trump are about to foist on the nation are the very communities that voted overwhelmingly Trump into office.” Jake Miller, a 7th grade U.S. History teacher in Pennsylvania, analyzes the key phrases regarding education from Pres. Trump’s inaugural address. Miller concedes there are things that can be done to improve our traditional public school system but Trump, on the campaign trail or in his inaugural speech, hasn’t mentioned any of them. In fact, Trump’s view of our schools, as is his vision of the rest of the country, is rather dim and foreboding. Miller’s commentary appears on THE EDUCATOR’S ROOM website. Pres. Trump is expected to announce his pick today to fill the Supreme Court vacancy created by the unexpected death of Justice Antonin Scalia in Feb of 2016. The author of the “School Law” column for EDUCATION WEEK previews some of the names on Trump’s short list and how they’ve ruled on previous education cases. He identifies 3 front runners for the seat and adds 2 more names to the list. Profiles of earlier decisions by the top 3 contenders are provided. Steven Singer, on his GADFLYONTHEWALLBLOG, tackles head-on that favorite shibboleth of the corporate “reformers,” privatizers and their allies–the idea that our traditional public schools are “failing.” “So why do we believe that American public schools are doing such a terrible job? Because far right policymakers have convinced us all that it’s true. It’s not. Let me repeat that in no uncertain terms – America’s public schools are NOT failing. They are among the best in the world. Really!” Before you think Singer needs to be medicated or committed to a mental institution, hear him out. He sets out a very detailed and convincing case as to why labeling our schools as “failing” is doing a serious disservice to that system. Just because certain groups and organization repeat over and over and over that schools are “failing” doesn’t make it true. This is a very significant piece and should be required reading by everyone on BOTH sides of the education debate. If you don’t read anything else related to education issues in the next week or so, read this one.